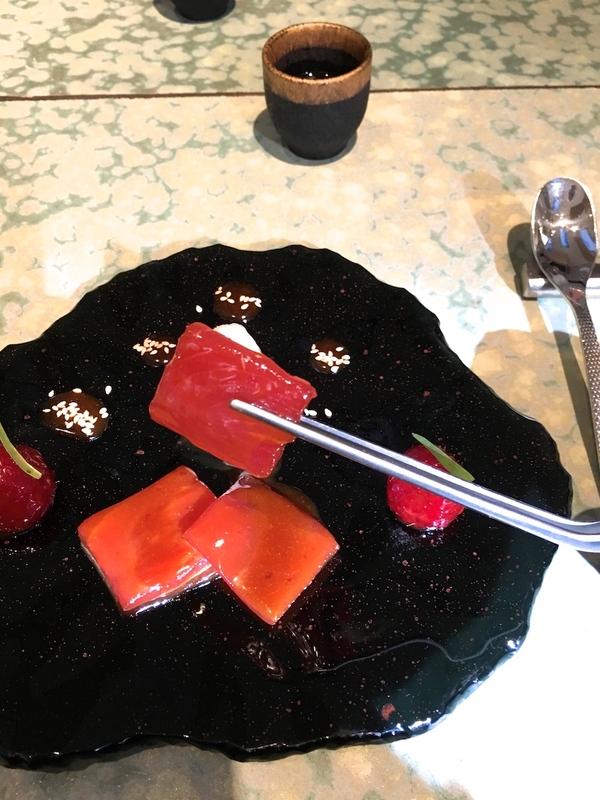 Molecular gastronomy has got a bad rep in recent years, mainly because a lot of people associate this type of cuisine with foams, gels and snow. Three important but often misunderstood technical innovations that sadly went from being ground-breaking and having a real purpose on the plate, to being overused and, even worse, often misused and ending up as an obligatory gimmick. 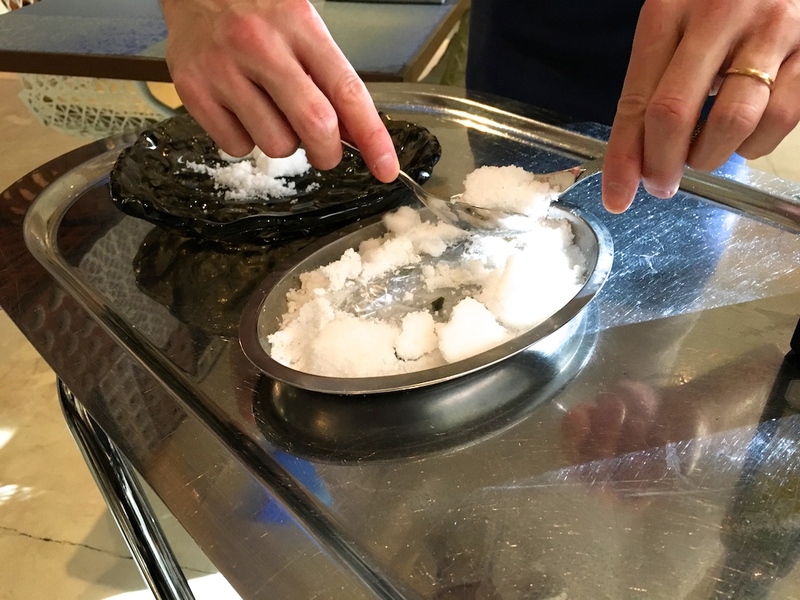 Luckily there's so much more to molecular gastronomy than gimmickry. In the past two decades it has revolutionised the way restaurant kitchens work, but people often forget that it dates bake to as early as 1970, when the sous-vide machine made its first appearance in a restaurant kitchen. And did you know the Pacojet was invented in the early 80s (Modernist Cuisine, volume 1) ? Molecular gastronomy fully matured in the noughties, when big name chefs practised and mastered the methods of this cuisine to perfection. To mention but a few: Grant Achatz at Alinea in the US, Heston Blumenthal at The Fat Duck in the UK, and in modernist Mecca Spain Andoni Luis Aduriz at Mugaritz, the Roca brothers at El Celler de can Roca, Juan Maria Arzak at Arzak, and of course the most famous of them all Ferran Adria at elBulli. During elBulli's glory years the restaurant produced a number of now renowned chefs, including the aforementioned Grant Achatz, Massimo Bottura, and Jason Atherton, although these chefs only spent a relatively brief time in Adria's kitchen. Three alumni that spent considerable time under the elBulli umbrella, are Mateu Casañas (b.1977), Oriol Castro (b. 1974) and Eduard Xatruch (b.1981), who were involved with the elBulli organisation since the late 90s/early 00s. Oriol Castro was head chef at elBulli for a number of years until its closure in 2011, with Casañas and Xatruch as his right hand men. 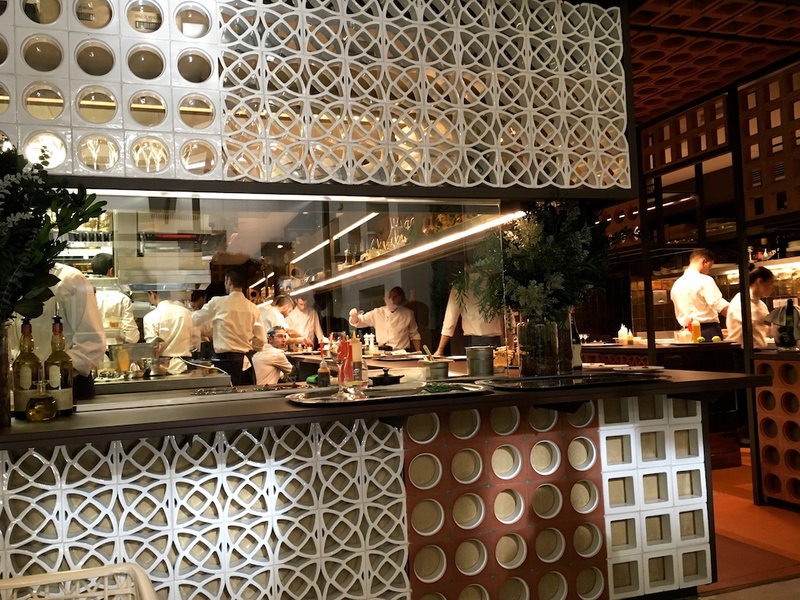 In December 2014 the trio ventured out on their own and opened Disfrutar in Barcelona and within a year the restaurant was awarded a Michelin star (2016 guide). Disfrutar is open for lunch and dinner Tuesday through Saturday and you can choose between several multi-course tasting menus. There's the Classic menu (± 20 courses for €110) or the extended Grand Classic menu (± 25 courses for €150); the same prices and number of courses apply to the Festival and Grand Festival menus. A recent addition is the Disfrutar menu, a special menu featuring both classic and new dishes, priced at €180 (the Disfrutar menu was not offer when I visited). I had lunch at Disfrutar early February and I ordered the Festival menu. Lunch kicked off with a frozen passion fruit, rum, mint and pink peppercorn flavoured "lady finger", a refreshing bite with subtle mint flavours. This was quickly followed by a savoury treat with a semi-liquid praline-like filling of salted, candied walnuts. A sensational bite with beautifully intense flavours. 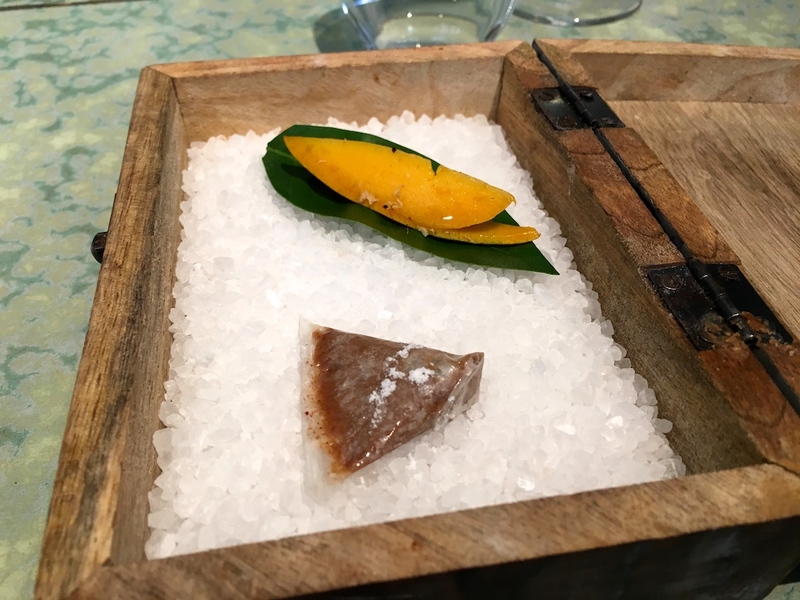 Arriving at the same time was a piece of soft and ripe mango, seasoned with whisky and tonka beans, the latter giving the mango a lovely vanilla-like touch. 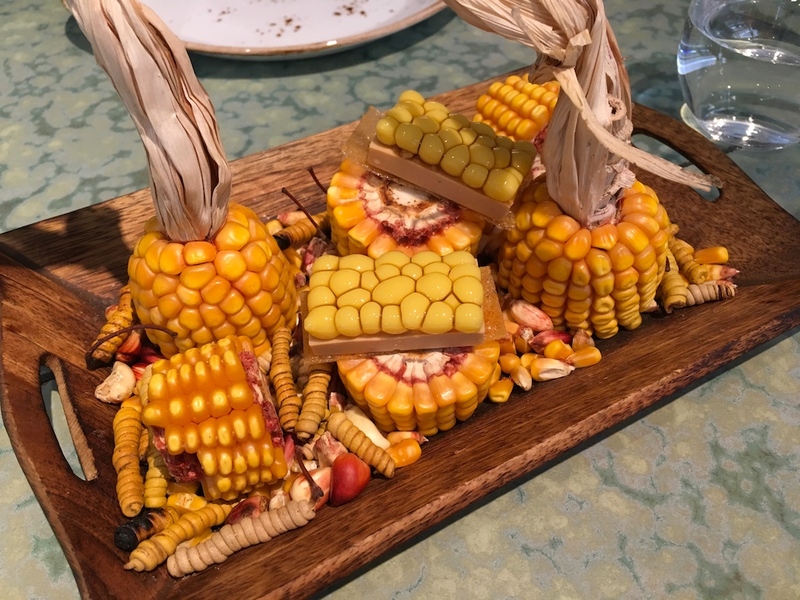 The next course was a beautifully made "Mille feuille of Idiazabal" with some apple and celery juice served on the side. 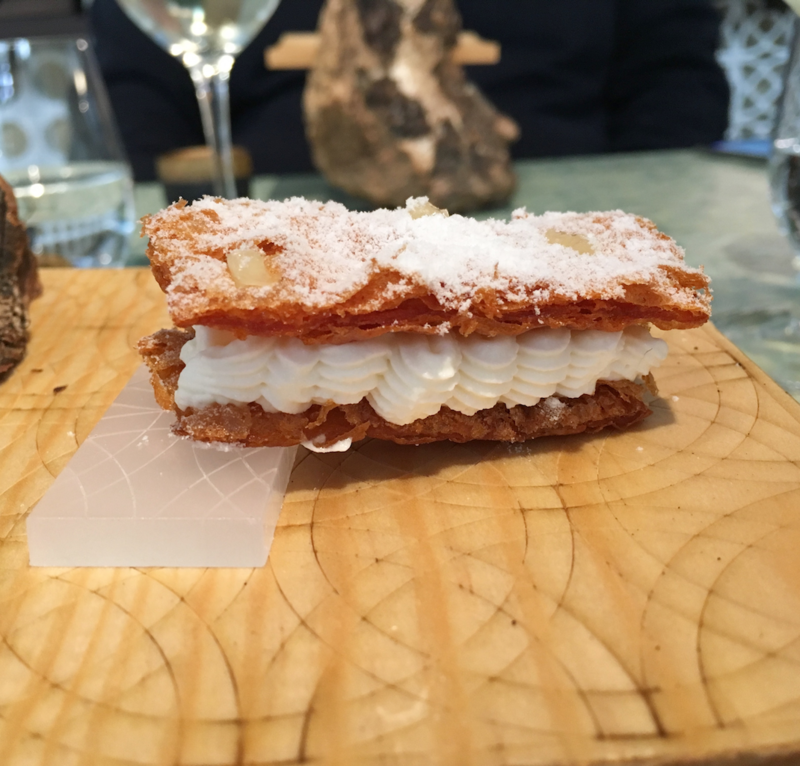 The mille feuille was made from crisped-up Parmesan foam, that had an incredibly light and crunchy texture, and the filling was a smooth and airy Idiazabal cheese cream. 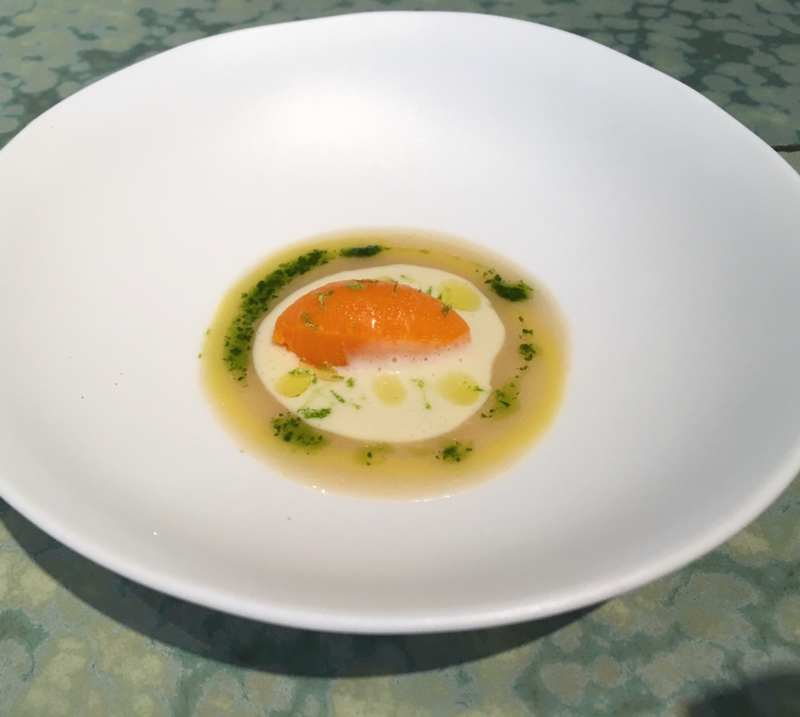 A textural feast with well-judged flavours, the cheese cream having a lovely piquancy to it, and the apple-celery juice delivering balance and freshness. Shortly after we were served a quite spectacular dish of foie gras and corn for which, as was explained at the table, a "multispherification" technique is used. 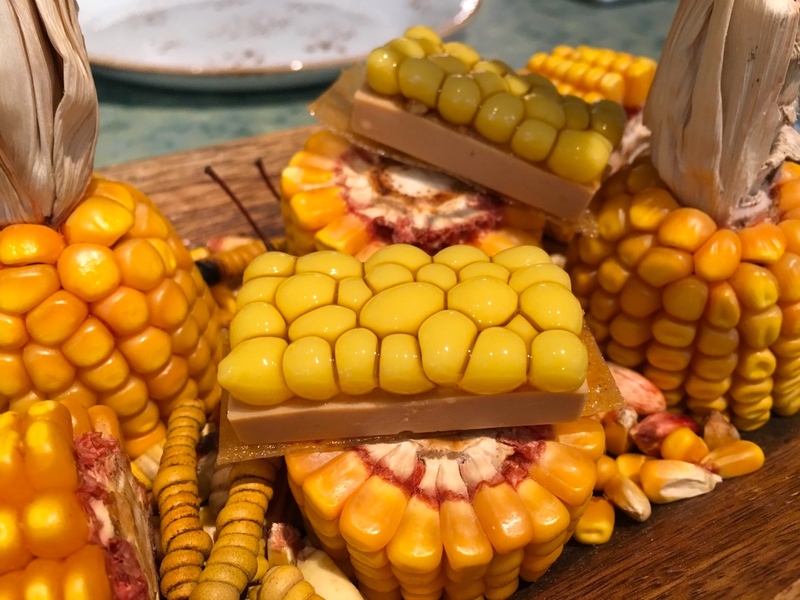 A neat, rectangular slice of foie gras was served on a thin tuile, and topped with corn kernels/spheres, each sphere releasing a liquid corn flavour explosion. A stunning dish both in flavour and texture. The fifth course today was "Ceviche deconstruction". 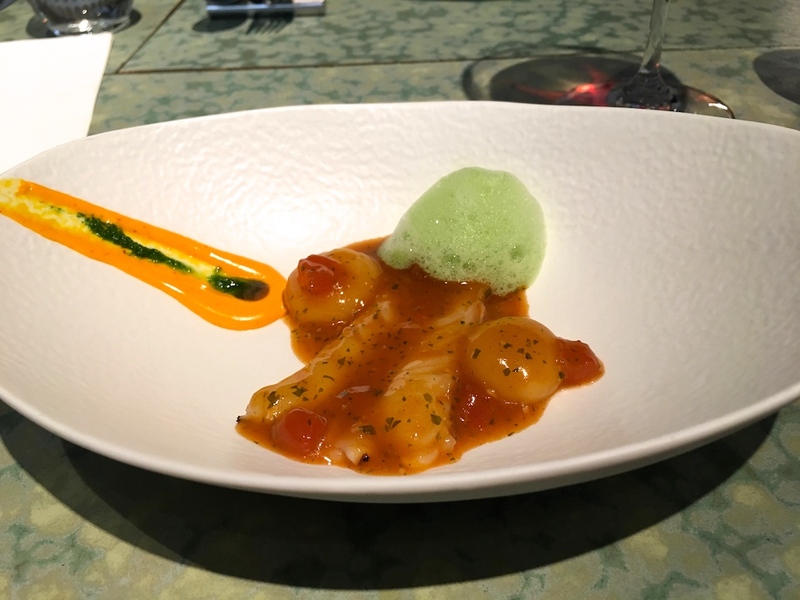 Deconstructed dishes often leave you longing for the original, but this was a delightful exception and a fresh and vibrant flavour experience of monkfish cream, red pepper sorbet with Ají chilli, tiger's milk and fresh lime zest. A wonderful interplay of salty, sweet and sour flavours, the lime zest enhancing the sweeter flavours and the chilli in the sorbet delivering just the right touch of heat. Razor clams followed. 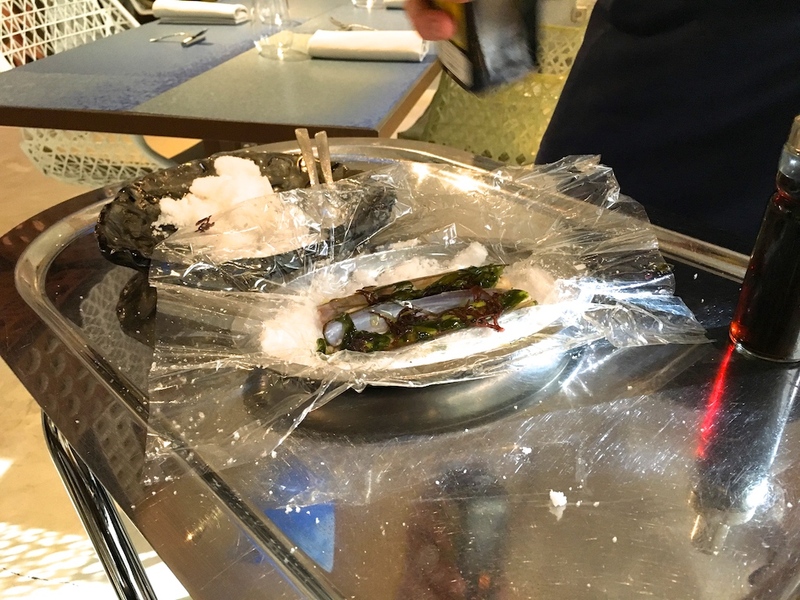 First the razor clams and various types of seaweed are cooked in a salt crust, chilled overnight, and then simply served with a few drops of olive oil and a spray of sherry vinegar. A lovely dish, in which the seaweed complemented the razor clams perfectly. 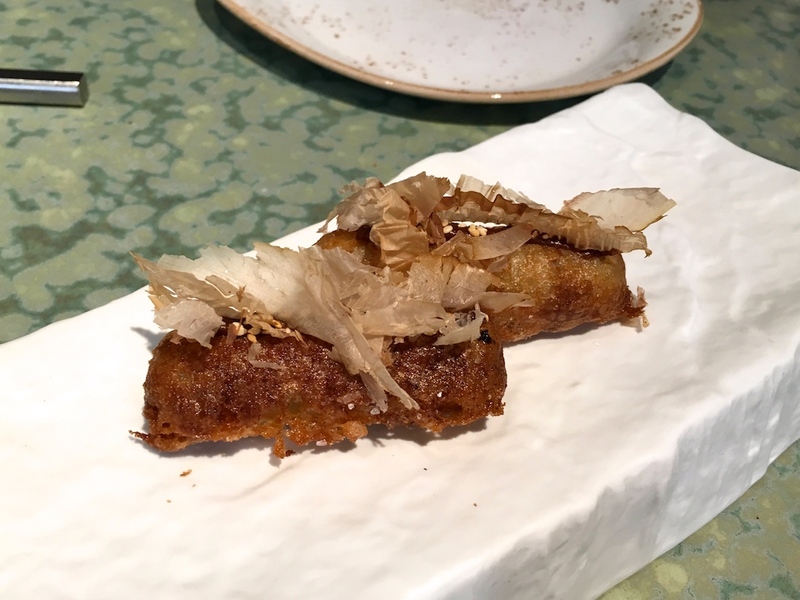 Eighth course was "fried eggplant with katsuobushi", a complex bite of crisp and delicate deep-fried batter with a silky and slightly smoky filling of liquid aubergine, its smokiness intensified by an umami garnish of katsuobushi (bonito flakes). Next up were three slices of tender tuna served with a mildly spicy yaki sauce/marinade, sake kasu (a by-product of sake) sorbet, marinated raspberries garnished with tarragon, and sake-yuzu juice. Another fantastic dish with great contrasting textures and temperatures and the yaki sauce gave the dish an elegant, spicy finish. 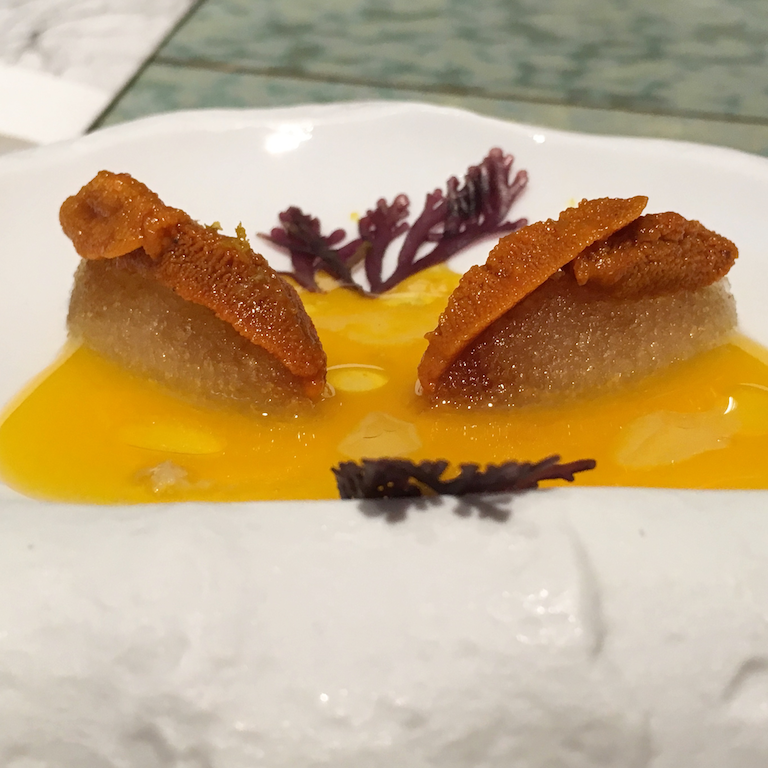 On to the tenth course, a creative dish of dashi semolina topped with sea urchin and served with an egg yolk sauce. A superb dish with an excellent and balanced use of umami-rich ingredients. Wonderfully soft semolina but still with a textured mouthfeel and it had a great synergy with the sweet brininess of the sea urchin. 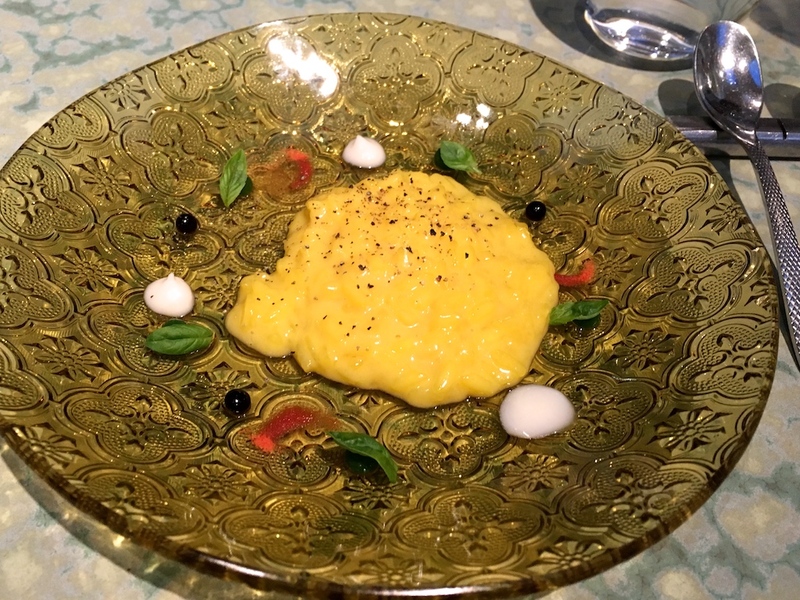 Equally wonderful was "tomato and basil risotto", a deliciously creamy saffron risotto with mozzarella cream, liquid balsamic and basil pearls, and tomato jelly. Delicate but intense flavours, served in a harmonious way. 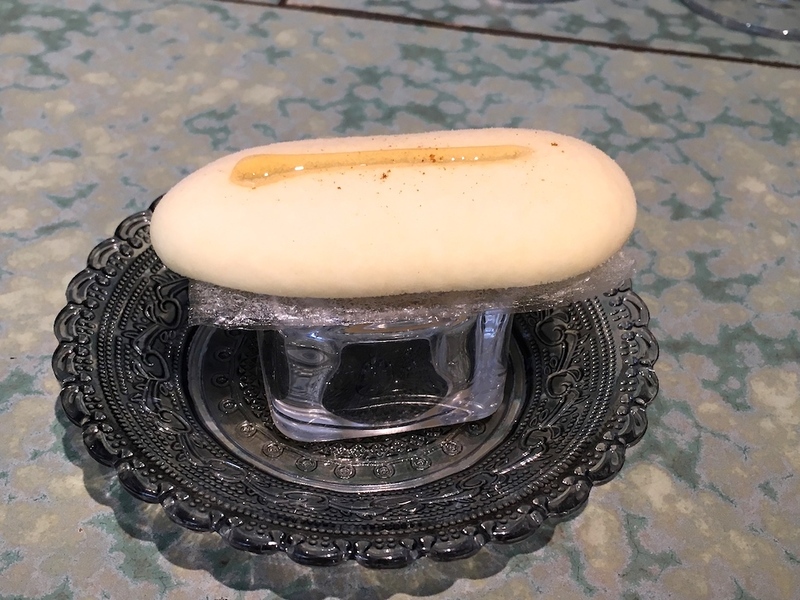 Then there was a "Gazpacho sandwich" of crisp tomato meringue "bread" and a filling of frozen gazpacho, served with a glass sprayed with sherry vinegar. A clever dish with superb textures, flavourwise capturing all the gazpacho characteristics, flavours that lingered on the palate. The sherry-sprayed glass adding to the flavour (= taste and smell) experience. The meal continued with a fat and juicy langoustine and meltingly soft gnocchi covered with an elegantly rich Suquet sauce, and served with a garlic-saffron aioli and a parsley foam. 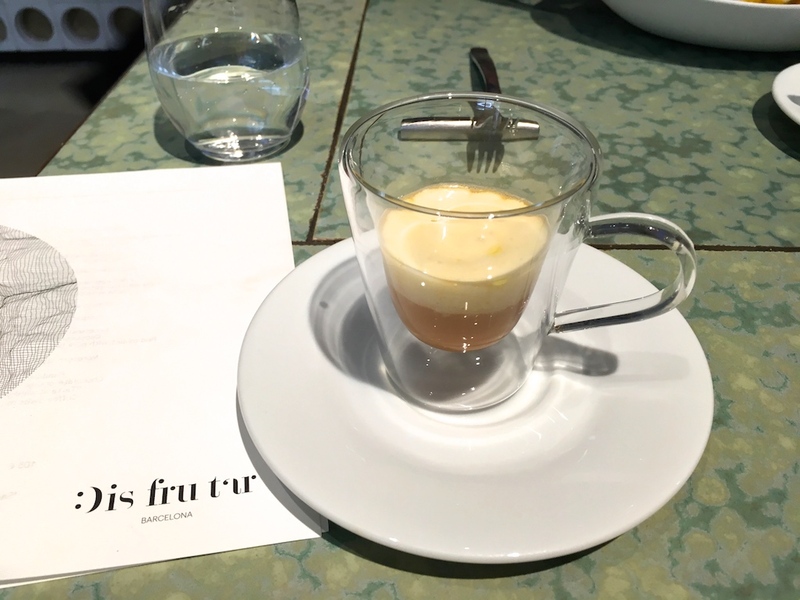 A Suquet bisque with potato foam was served on the side. Traditional flavours served in a new and different form, both the Suquet sauce and the bisque having great depth of flavour. 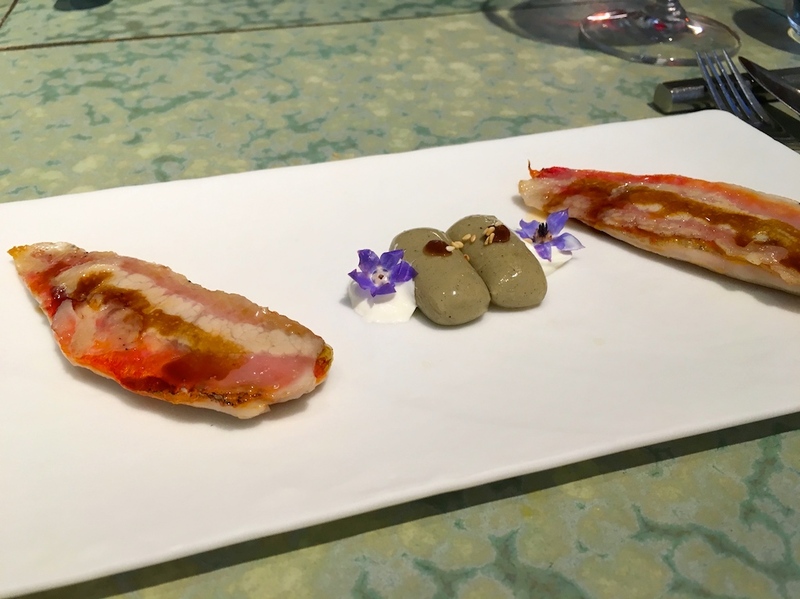 Next to arrive was a piece of red mullet covered with a thin, slightly melting slice of pork jowl, and seasoned with a few drops of soy sauce. Also on the plate were some "liquid gnocchi" with a gorgeous, silky smooth, aubergine filling, and some yoghurt vinaigrette crème delivering some acidity for balance. The last course before dessert(s) was "Moroccan style pigeon". 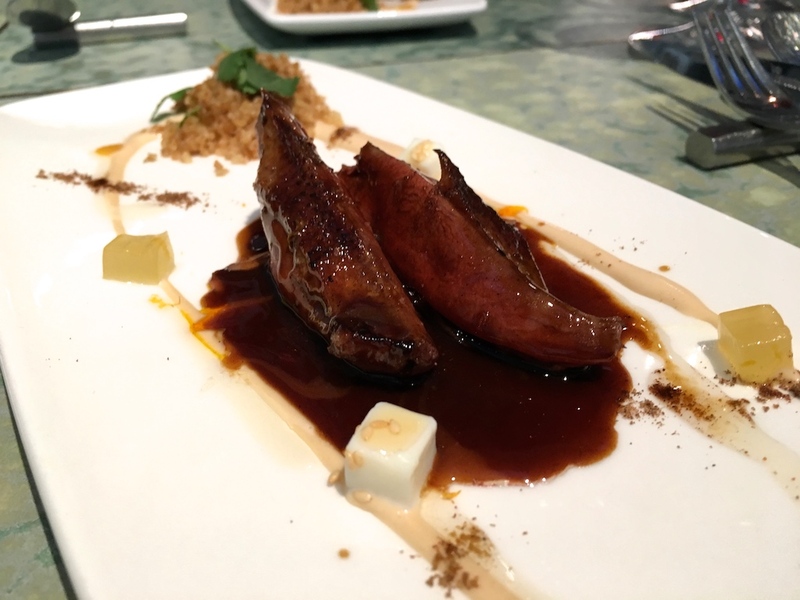 Skillfully cooked pigeon complemented by a deliciously intense pigeon jus, couscous and an almond cream sauce. A delightful Moroccan flavour marriage, with wonderful sesame, ras el hanout, orange and saffron flavours coming through from the pigeon and pigeon jus. Time for dessert. 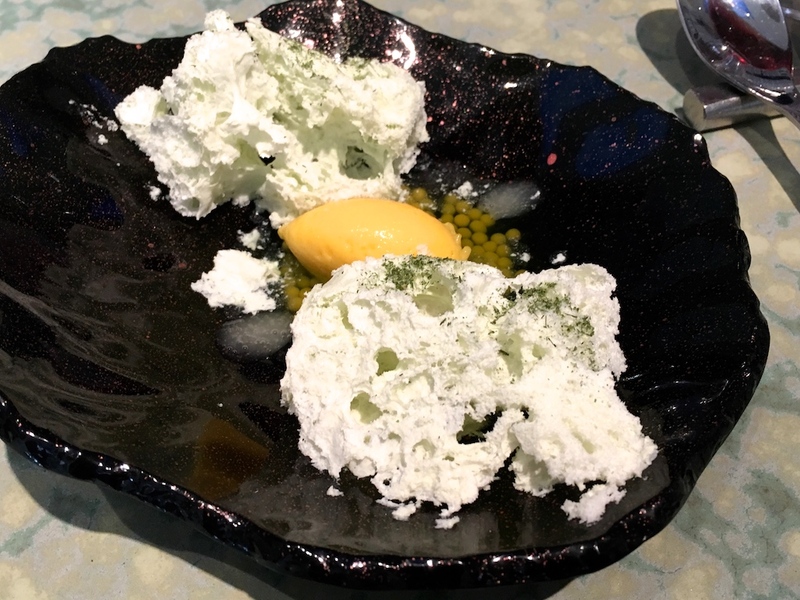 First up was an elegant and refreshing dessert of slightly crispy coconut foam which (once in your mouth) transformed into a crème, and was served with a clean-tasting mango sorbet, liquid mango pearls, and some pandan juice. 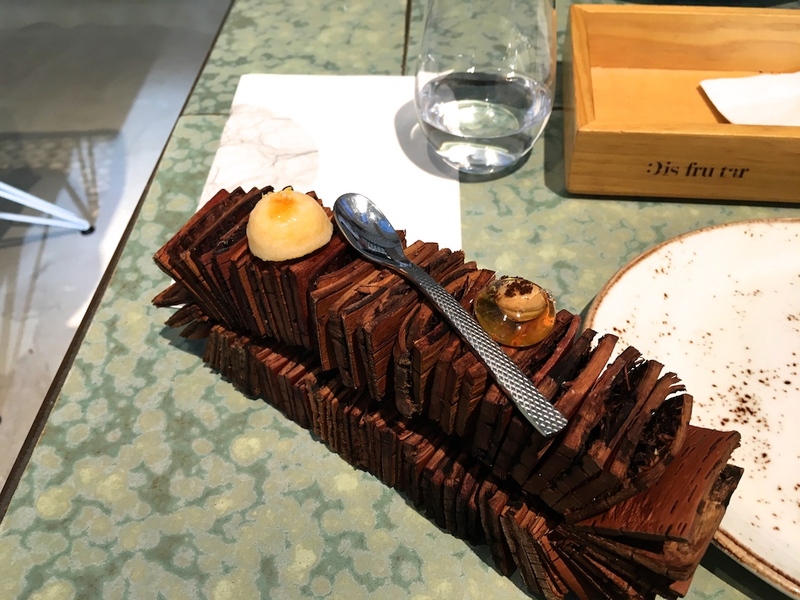 Two "olives" followed, both with thin cocoa butter casings and soft chocolate fillings, and served with some crisp toast and a spoonful of orange flower essence on the side. 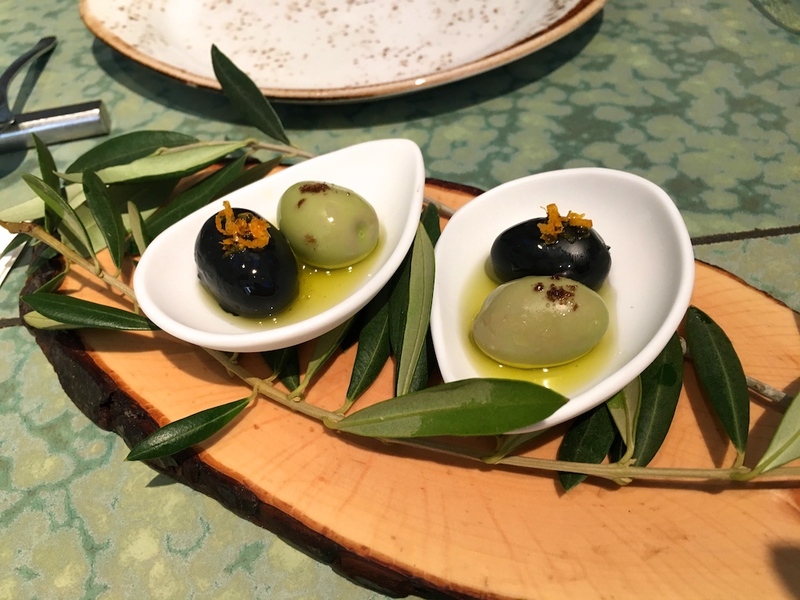 A delicious course, the olives and the toast creating a lovely savoury-sweet combination. The third dessert, "Tarta al whisky", was comprised of four parts. 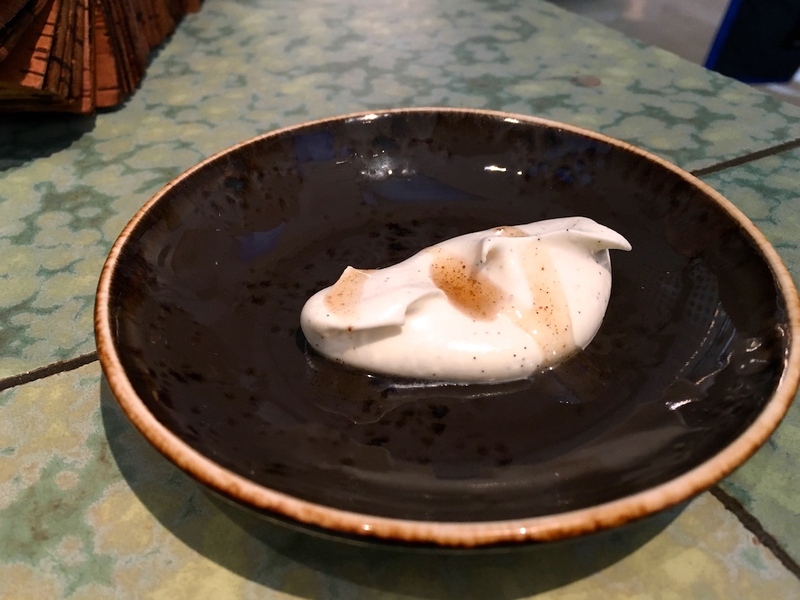 The whisky part was a few drops of Lagavulin to be rubbed between your palms, and was followed by a little plate with vanilla cream and yuzu, a "crisp custard" bite, and finally hazelnut and hazelnut oil captured in a crisp, transparent sugar wrapper. An enjoyable course, pleasing all the senses. 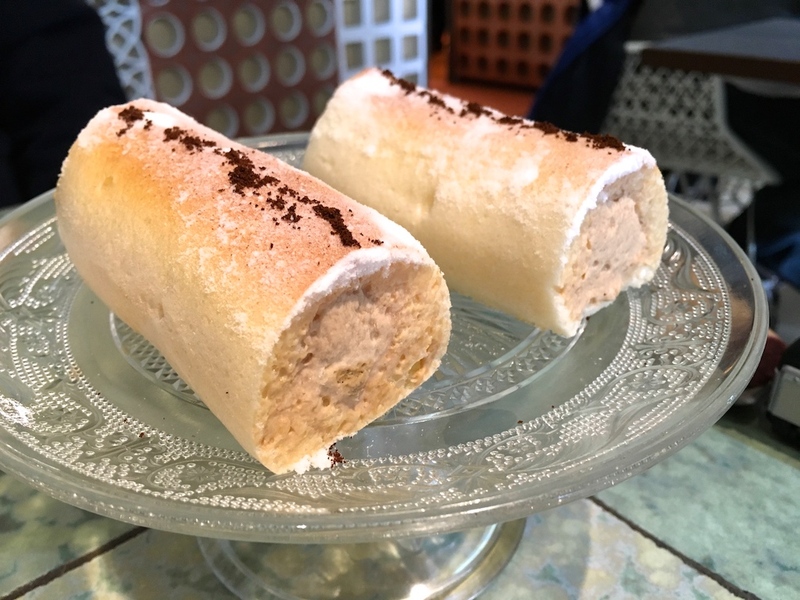 Best of all was the final dessert, Disfrutar's take on the classic Swiss roll, a meringue cylinder with a creamy coffee and hazelnut filling. The meringue had a beautiful, airy and brittle, texture, but instantly dissolved on the palate and the coffee flavours were nice and strong with lovely bitters. Spherification: what better example is there of one of the best techniques to have stemmed from molecular gastronomy? The showstopper today was the foie gras and corn dish, for which the multi-spherification technique was used. 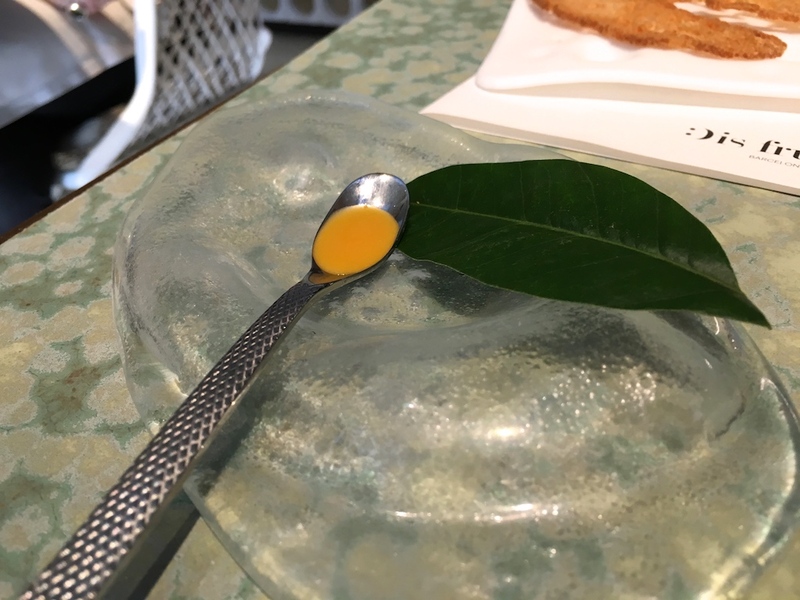 ElBulli developed the spherification technique (also known as reverse spherification) in 2003 and the best-known example was their "liquid olive" (introduced on the menu in 2005, and nowadays featuring on the menu of Tickets in Barcelona). But I never went to elBulli, so I'm a blank canvas when it comes to elBulli-esque food, and I was therefore able to judge Disfrutar on its own merits. At Disfrutar molecular techniques are a crucial and essential part of the dishes, but they are only used if it has a gastronomic purpose and/or adds to the experience. 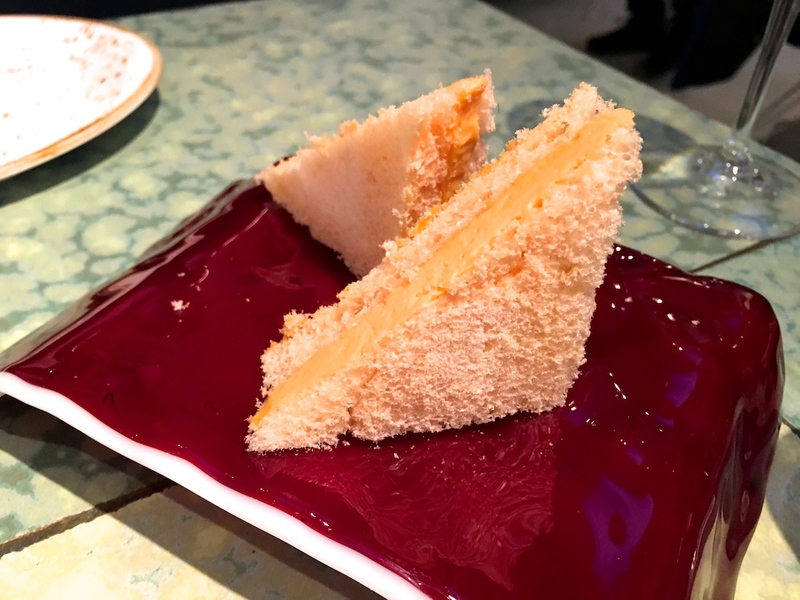 The food is entertaining, with an element of surprise in almost all dishes, but entertaining with integrity and finesse, and not at the expense of taste. Familiar flavours or traditional dishes are transformed into imaginative and exhilarating food. Disfrutar is an outstanding epitome of molecular gastronomy and the chefs' knowledge, skill and creativity shows on the plate.